Amazingly, half of all Americans say they don’t care about government surveillance — and during a random sampling of people on the streets of New York City not one could identify Edward Snowden, or what he did. That’s despite an Academy Award winning documentary on his release of classified documents about the spying activities of a National Security Agency called Citizenfour. The government is collecting data from you all the time. From your phone, computer, tablet, credit cards, travel records and more. We know they are doing this because of former NSA contractor Edward Snowden. 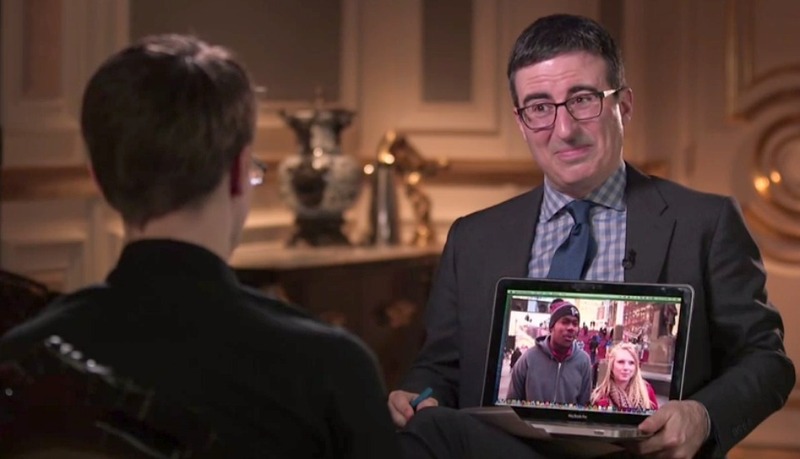 John Oliver traveled to Moscow where Snowden, wanted by the U.S government, has asylum for the next three years. There he interviewed Snowden in an attempt to find out why more Americans don’t care about the government spying on their personal lives. Based on Snowden’s explanation of the government’s spying activities, here are five basic questions every American should ask themselves about the NSA surveillance program. 1. Do you want the government to collect your data (including your naked pictures)? According to Oliver, Pew Research found that 46 percent of Americans say they don’t care about government surveillance. Why? It’s too complicated and technical to try to trace the life cycle of a text message. Hilariously Oliver tries to put the issue into terms Americans will care about — whether or not the government has access to your naked pictures. Once everyday folks heard the argument in those terms, they got interested in the debate pretty fast. “I did this [released secret NSA spying information] to give the American people the chance to decide for themselves what kind of government they want to have,” Snowden tells Oliver. Do you want a government that hoards your most scandalous communications? 2. Why did the government lie about its spying activity? On June 1, 2015, key provisions of the Patriot Act are set to expire, including the controversial Section 215 provision, which has been interpreted by a FISA Court to mean that the government has the authority to collect comprehensive data on its citizens. Prior to the Snowden revelations about programs like PRISM, American government officials — including President Obama — said the government was collecting only basic phone and internet records, like when a call was made and to whom (metadata), rather than the actual content of the conversation. Snowden proved that’s just not true. The Snowden documents showed that the government was collecting and storing the content of Americans’ communications too, like emails, phone calls, internet searches and text and chat messages, rather than just basic call record information. Worse yet, it’s not just being looked at; it’s being stored in monster government data centers in Utah, in case it needs to be looked at in the future. So if you want to play a semantics game, they aren’t actively looking at it, just saving a copy in case they need to later. Does that make you feel any better about it? 3. Can you trust the government with this kind of power? Mobile phone data provides an incredibly detailed account of your life — your location, who you call, emails, text messages, internet searches, online shopping habits. Combine that level of detailed data contained in your credit card records, home and work emails and internet searches, and that’s a pretty freaky accurate representation of who you are, where you’ve been, with whom and what you were doing. But not totally accurate. Your phone data might put you in a mall food court at the same time as a terrorist, but does that mean you’re a terrorist too? What if you just both happen to love Orange Julius and soft pretzels? Now, imagine in the future the government charges you with a crime. Any crime, really. Doesn’t matter which. For belonging to the wrong religion. For being too friendly with someone the government doesn’t like. Happens all the time around the world. Rather than the government having to collect evidence about your crime to prove your guilt, it’ll already have a pile of information on you it can use however it chooses. No warrant. Nada. We might be cool with all of this surveillance capability being used against the terrorists, but what if it’s turned on Americans one day? So do you trust them? 4. How do we balance privacy and safety? The Patriot Act was conceived amidst the fear following the Sept. 11 attacks on the U.S. But even one of the primary authors of the Patriot Act, Wisconsin Congressman Jim Sensenbrenner, testified that the legislation was never intended to authorize the bulk collection and storage of the communications of U.S. citizens and that its powers should be reined in when the Patriot Act is reauthorized this summer. Government officials argue that this kind of surveillance is critical for fighting terrorists and those who would do America and Americans harm. That sounds totally reasonable and fair. But with programs like PRISM and other surveillance activity Americans have no idea is going on, how can we have a debate and balance the idea of security against the idea of liberty? How much privacy are we willing to give up for less security risk? 5. Are you on a watch list? At the end of the interview, Snowden gives John Oliver a pretty ominous warning — that by interviewing him, Oliver is likely now on a very serious, very scary U.S. government watch list. The idea of a watch list is discussed in more frightening detail in the Academy Award-winning documentary about Snowden, Citizenfour. Americans are put on watch lists all the time, which brings increased scrutiny of communications, increased surveillance and, when traveling out of the country, often problems getting your passport cleared across international borders without intense questioning. But how do you know if you’ve done something to raise the government’s suspicions about your activity? Am I on a watch list just for writing this article? Are you for reading it? How would we know? It’s a secret. The principles of transparency and checks and balances the U.S. government is founded on demand that citizens be informed about these kinds of government activities. Whether you view Snowden as a hero or a traitor, as he says, now you know what your government is doing in our name. Do you care? Does it bother you? We should be allowed to have this debate and make an informed decision one way or the other. In the meantime, John Oliver and his team of brillant writers have distilled the argument down to this: Do you want the government to have a picture of you naked?